Taste test: The regular variety of Lay's is a salty and somewhat greasy chip, so we were eager to try the lightly salted version. These chips were about the same consistency as regular Lay's, but you can definitely tell that there is less salt on them. My first thought was that these tasted exactly like the regularly salted version of my favorite local brand of potato chips, Wachusett, so you could taste the potato rather than the salt and oil. 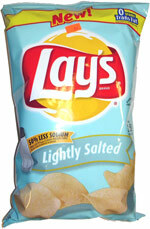 Frito-Lay has a winner with these chips. I will definitely pick this bag over their regular version any time. Of course, I'll still reach for the Wachusetts if they're available. Smell test: Smells like potato chips, but with less salt.